Is that a mountainous Trimaxion Drone Ship1 hovering above Buckinghamshire, England? Sadly not – this is actually the Milton Keynes Xscape, one of three leisure centres in the UK which contain, well – mountains. Xscapes are centered around a real-snow indoor ski slope, and this particular one is also designed to look like a snow-covered hill. It’s also the location of a 16 screen cinema, shops, a climbing wall, bowling lanes, bars, a fitness center, and somewhere round here’s there’s also an indoor skydiving centre! Very, very cool. 1) Whaddya mean you’ve never heard of a Trimaxion Drone Ship? Sheesh! It’s the spaceship from The Flight of the Navigator! Gesh, that looks like some sort of car testing facility? Some sort of driving school perhaps? Very interesting though. OK, but what is this thing inside that facility: View Placemark ? Is that some sort of long wavelength radar reflector? Just looks like a skid pan to me. I did’t mean the circle, otherwise I would have centered it in my link (hint: zoom further in 😉 What I meant is the croissant-shaped structure in the NE of that circle. it’s just some fancy archetecture. I’m more curious about the long building just ESE of it. it looks too thin to be a garage…. Maybe a crash test acceleration “tunnel”? If someone wants to find the actual ship from FOTN, it’s somewhere around here. 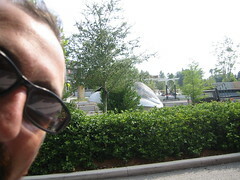 I think I figured it out… The ship is located in the boneyard at the Disney-MGM Studios backlot. Here’s the map: http://www.wdisneyw.co.uk/mgmmap.html I could only find one image of the ship in its current (as far as I know) location: http://static.flickr.com/22/34979178_daa4677ed6_m.jpg That puts the ship to be somewhere in this area. View Placemark Unfortunately, the better quality imagery stops just north of the pointy wizard’s hat. I like near Milton Keynes, and actually Xscape can be seen for over 15 miles! There is a huge tv screen of the front which plays various sports videos. 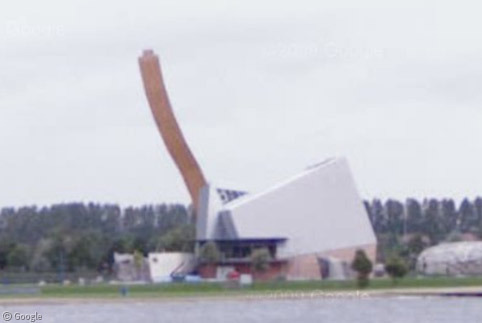 The sky diving centre is at the very back (the smallest end), its not actually part of the Xscape building but its connected through a walk way. Due to the shape of the building, there can be high force gale winds at the very front! And the slope is real snow may I add! Yes there are hundreds of trees and tons of concrete but it is a new city. Milton Keynes has new plans to build a scuba diving centre or a marina thing for people to go obviously go scuba diving! Wow! Inever imagined to see this on here. I live in Bedford which is 20 miles away from Milton Keynes and I have been to Excape many times. Its an awesome place. Lots of cool stuff inside. There is even a night club along the side of it that i go to which is very good. I knew it was a big place but never realised how big until I saw this!